Also a relevant topic: Read and Post a Response to Sandy's essay on Appalachian Language! Tennessee Ernie Ford's Ballad "Sixteen Tons"
Murray City coal mine # 5, view towards the lower end of town. 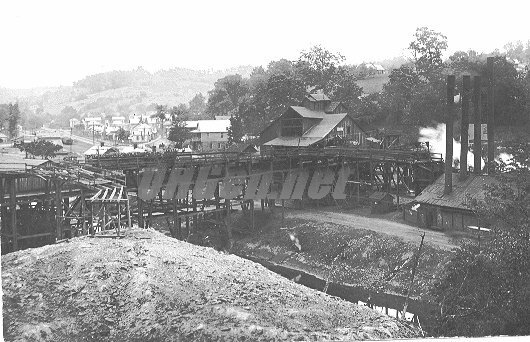 A large part of the history of Athens, Hocking and Perry counties in Ohio is the local coal industry. Our ancestors bravely went to work in the dark, damp coal mines to support the needs of their growing families and their lives were tough, often they were cheated out of the pay they deserved by the coal barons of the industry. Working conditions were dangerous and miners died from falls of slate. If they were to strike over the poor conditions they were working in, the coal barons would bring in men from southern states and foreign countries to fill their positions, leaving the miners with little options, angry wives and hungry children. Many miners resorted to making Moonshine to sell during the prohibition years so they could feed their families. We need to lift our hard working ancestors names up in history and give them the honor they deserve for the tough lives they lived in order to provide for their families. The Knights of Labor union party, and United Mine Workers of America was formed in the early 1880's due to unrest among mine workers when asked to take a cut in pay mayhem resulted with miners striking out against the coal barons (Syndicate). 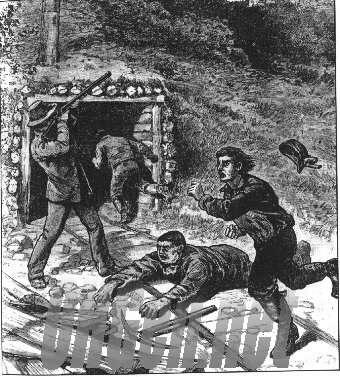 The Syndicate requested help from the Governor and he sent in the Pinkerton Guards to protect the strike breakers and new laborers which were brought in to replace the striking miners. 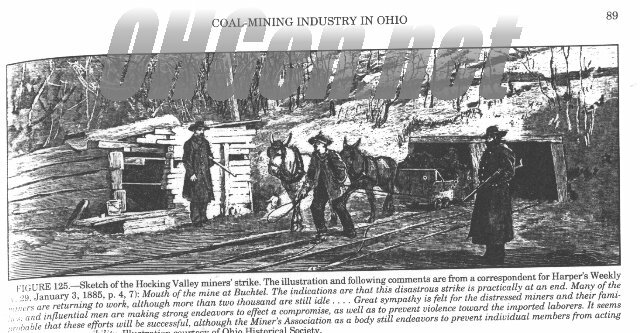 During the mine wars of 1884 some coal mines in New Straitsville, Coal township, Perry county and Sand Run in Hocking County, were set ablaze by striking miners and some are still on fire to this day. The fires were set in response to the mine owners putting out the striking miners and their families from company owned housing. For a wonderful illustrated history of the Ohio Coal Industry, contact the Division of Geological Survey, 614-265-6576 to order a copy of Douglas L. Crowell's "History of Coal Mining" book. Charles "Ike" Mitchell driving heavy equipment in a Murray City coal strip mine about 1945. Photo courtesy of the Ike Mitchell family copyright 1999 "We sure do miss you Grandpa!"